"Climbing — this one act saves me," says Portland rock climber Bob Grunau. Throughout his life, Grunau has struggled with the lingering clouds of depression. Until he discovered climbing, the only way to weather the darker cycles was to retreat inward into his mind. That approach worked until he became a part of a family. Grunau had to be present. In those hard moments, he turned to climbing. High, lonesome places can provide respite and joy. We can love them deeply, but ice and rock will not love us back. Ultimately, our tenuous connections with the vertical life are not nearly as delicate as our relationships with those we love. 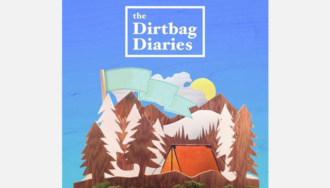 For more audio expressions of the outdoor life, or to submit a Shortz story of your own, head over to www.dirtbagdiaries.com.